For members new to sailing we offer thorough sail training on the best-maintained fleet of vessels out of Jericho Sailing Centre. How much experience do you need? None! We’ll teach you everything you need to know and provide you with a chance to grow from novice to experienced sailor on a variety of boats. Opportunities to pair up with Senior members for additional training time if needed once the formal training period ends, usually in June. All new members start as Novices and upgrade their rating with experience and by demonstrating competency in our training curriculum. The club has three dinghy ratings: Novice, Intermediate, and Senior. We also offer regular training days for our sailboards and kayaks to all members, and on catamarans and Lasers to all sailors who have achieved their Intermediate rating. Be aware that a life jacket / PFD is necessary in all Viking dinghies. Your first steps to becoming a competent sailor begin in the classroom. Classroom sessions are conducted on a week night beginning in early April. Here you will learn things like the parts of a boat, language of sailing, personal gear you will need, sailing manoeuvres, points of sail, right-of-way, how to safely handle a capsize, and knots you’ll need (eg. bowline, reef note, figure-8, clove hitch). Even if you are an experienced sailor, we encourage you to attend these sessions. You will meet new friends and potential shipmates as well as learn how to do things the Viking Way, a necessary requirement to maintain our fleet in shipshape condition and to upgrade your rating. Next, you will spend time in the Jericho compound familiarizing yourself with the Tasars and learning how to rig them. 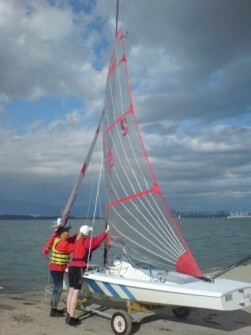 Tasars are the club’s training boats. They are double-handed dinghies sailed by a helmsman and one crew member. You will then go out on the water as crew with an experienced Viking Senior who will help you bridge the gap between classroom knowledge and practical experience. On-the-water training sessions begin in April and are held on Wednesday and Thursday evenings and twice on Saturdays. Formal Novice training usually ends in late June. Check out the Viking Sailing Club Training Curriculum Checklist below for complete details of what your training includes and the experience you will gain. In general, to sail our fleet and upgrade ratings, you train, practice, and then demonstrate competence in the above skills to the rating level you want to sail at, in the category of boat you want to sail, to the training director (Vice-Commodore) or their designated Senior trainer. Progress is at your own pace and depends on the time you put in and what you want to achieve.